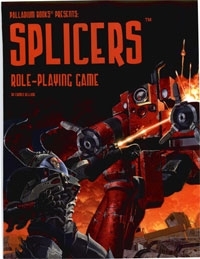 Splicers is a role-playing game that combines science fiction and horror in a post-apocalyptic setting on a world that could be Earth or a coloney world. The people themselves don't know. What was once a world dominated by humans and advanced civilization is now a world in ruins. The once great cities are shattered ruins or being torn down and terraformed into lush forests. The few cities that do exist are either historical recreations populated by androids or Retro-Villages, an innocent euphemism for a "zoo" for humans. How did this all happen? The Machine took over, decided humans were vermin that needed to be exterminated, and sent a couple billion robots to wipe out humankind. Our story starts generations later, as the Human Resistance makes its boldest move to reclaim parts of their world and find a way to stop the insane Machine. It is a story of sacrifice and triumph, of undying spirit and weird science. Overview and history of the Splicers world. The Machine, its insanities and seven personalities. The robots of the Machine. Drones like the Necrobots and Necroborgs. Extermination robots like the Cable Snake, Sewer Prowler and Skitter Pod. Hunter-killer robots like the Steel Trooper, Assault Slayer, and Flying Strike-Ship, and juggernauts of destruction like the Battle Track and Land Dominator. 19 robot/drones in all. The Human Resistance and their living organic weapons and technology. Super-powerful Host Armor, War Mounts and Bio-Weapons. The Splicers: Archangel, Dreadguard, Packmaster, Saint, Scarecrow, Skinjob and others. Ten superhuman O.C.C.s of the Human Resistance, their weapons and dreams. Compatible with Rifts, Mechanoid Space and other Mega-Damage settings. 224 pages by Carmen Bellaire with Kevin Siembieda. Endless possibilities, limited only by your imagination. No physical book to buy? Splicers is great! Content is great! You can tell someone at Palladium wrote the description when the first sentence has a typo. Coloney? Seriously? One issue I'd like to point out which is an important consideration is that this is literally a scanned copy of the book. There is no book marking in the .pdf file. This title was added to our catalog on August 27, 2009.